The week started off well enough for the Crested Butte Titans boys’ basketball team as they defeated Nucla on Tuesday, February 5. After building a seven-point lead in the first quarter, the Titans outscored Nucla 21-7 in the second quarter to take a 36-15 lead into half ultimately cruising to a 58-29 win. Junior John Wright led all scorers with 18 points including shooting 100 percent from three-point range and senior Joe Bosshard followed Wright among scorers with 13 points. The Titans carried the pace from their Nucla win into a game against Moffat on Friday, February 8 for a 78-41 rout. Wright led all scorers again with 16 points, Bosshard put in another outstanding offensive effort with 12 points and senior Randy Evans scored 10 points and pulled down 10 rebounds. 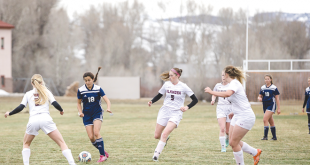 The Titans hoped to carry momentum from the two wins into the weekend as they faced Ouray once again. Ouray handed the Titans a 54-42 loss a week earlier in Ouray but Crested Butte was poised to return the favor at home in Mt. Olympus on Saturday, February 9. The Trojans took charge of the game early, building a seven-point lead as the Titans shooters struggled. Down 9-2, Titans coach Robin Loyed called a timeout and switched to a three-guard set with Wright and senior Carson Grogg down low. The switch worked as Grogg pulled down an offensive board and scored, senior Will Curry hit a three-point shot and Wright hit a free throw to close the Trojan lead down to three by the end of the first quarter. Ouray opened the second quarter riding the shoulders of their big man in the key and the shooting of one guard outside to take a 21-11 lead. Every time the Titans collapsed on the big man, Ouray kicked the ball outside the arc for a three-pointer forcing Loyed to call another time out before it was too late. The break cooled off Ouray and the Titans outscored Ouray 12-2 to end the second quarter. Wright and senior Alexei Desmarais each knocked down a three-pointer and Evans crashed the boards while Bosshard broke up the Ouray offense with outstanding defensive hustle. The effort pulled the Titans back into the game tying it up 23-23 by halftime. The Titans took the lead in the opening minute of the third period as Evans sank a six-foot turnaround jump shot but Ouray turned back to their two key offensive players to pull ahead 36-28. Ouray’s defense frustrated the Titans all game long, especially in the fourth quarter, as the Titans struggled to find quality open shots. The Trojans never let their lead get below seven points as the Titans shooting woes continued. Crested Butte ended up shooting a dismal 25 percent from the field in the game and Ouray was near perfect from the free throw line down the stretch to hold its lead and defeat the Titans 53-42. 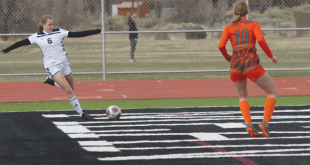 The Titans will stay at home for its next two games at they face Creede on Friday, February 15 at 5:30 p.m. and Vail Christian on Saturday, February 16 at 4 p.m.